Look no further than SGS Engineering for the high lift trolley jack that meets the needs of your garage business or workshop. We sell high lift, long reach trolley jacks with different capacities and long length jacking abilities – and we’re sure we have the perfect solution for you. Explore our superb range today and find out what makes SGS garage jacks the number one choice. From our 1.5 ton professional service jack to our 22 ton pneumatic air service jack, quality and durability are integral features of our high lift trolley jacks. Built to last, these products are well-suited to personal or professional use – ideal for any heavy-duty job or task that involves lifting objects or vehicles with low ground clearance. Our low-profile, long reach trolley jacks come with long reach chassis and extra-long handles – giving you access to deep set jacking points. In addition, the extensive lifting range means our jacks are more than capable of lifting most vehicles – from cars to buses, lorries and coaches. All high lift trolley jacks for sale through SGS are designed with safety and ease-of-use in mind. To save time and effort, our jacks either come equipped with foot pedals or a high-performance air pump. For even the most demanding auto jobs, SGS garage jacks are more than capable. 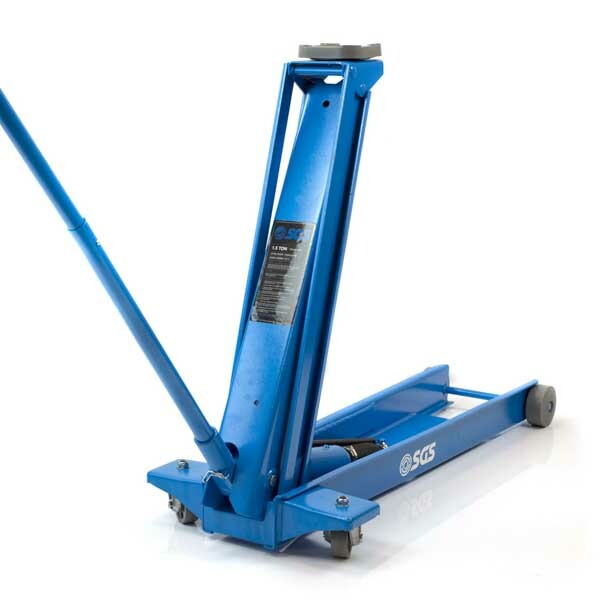 From a simple tyre change to mechanical inspections and full-scale brake assembly work – our range of high lift trolley jacks help you lift a vehicle with the minimum of effort. The SGS Engineering team is here to help if you need advice or have any questions about your lifting needs. Using our expert garage equipment knowledge, we’ll match you with the high lift trolley jack that’s right for your personal or commercial working environment. All our high lift, long-reach trolley jacks come with a two-year warranty for your peace of mind. If you’re not satisfied with your SGS trolley jack for whatever reason, simply return it within 60 days of delivery and receive your money back under our no-quibbles return policy. For any enquiries, feel free to contact us on 01332 576 850 or sales@sgs-engineering.com. For your home or professional garage, it’s essential to be able to lift and work under a vehicle. But working under a car, bus or van can be dangerous unless you have the correct equipment. That’s why we’ve produced some handy how-to guides to help you lift safely and effectively. Chocks to Jacks to Creepers - Find out more about other essential items of garage equipment you might consider purchasing. How To Bleed or Air Purge a Trolley Jack - Is your trolley jack not lifting properly? There could be trapped air in the system. Watch our video to find out how to purge the air and keep your jack working correctly. How To Buy The Right Trolley Jack - From changing a tyre to working on brake assemblies, know which jack you need.